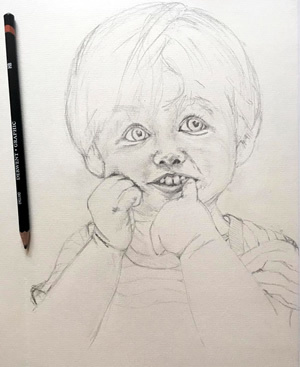 Would you like to learn how to sketch your child? A perfect memory of their younger years, or perhaps as a present for a grandparent, there is something magical about a sketch portrait. This will be a 4 hour hands-on workshop led by Director Daisy Rogers in a small group of 4-6 students, with lunch afterwards, offering a lovely chance to meet like-minded people. You will need some photographs of your child where the light is good and ideally they are on their own. Workshop dates: the next workshop will be Thursday 7th March. Further spring term dates available on demand, and summer term dates to follow.